Next-Generation Maruti Alto 800 is speculated to launch in India sometime during the year 2019. it is likely to get a crossover design and better features. to compete with its rivals. Maruti Suzuki is likely to introduce the next-generation iteration of its popular entry-level hatchback Alto 800 in India sometime next year. So far, Maruti has been mute about its plans regarding this vehicle. However, looking at the current market scenario and considering what other players in the entry-level segment have to offer, we can make some assumptions about the new version of India’s largest selling hatchback. Going by recent developments, we believe that the new Maruti Alto 800 will have a slightly bolder and muscular design, matching that of a crossover and will have, among other feature upgrades, a touchscreen infotainment system. Sales in the compact hatchback segment in India are currently witnessing a noticeable downfall. Buyers have started to opt for second-hand cars, rather than purchasing new ones as the entry-level segment in India has seen no activity in the recent past. Buyers are now wanting to buy premium and are not willing to sacrifice of functional features. Hence, they prefer to opt for a pre-used car as they get better and feature loaded models at the same price as an entry-level product. Keeping this in mind, it would be safe to say that the future iterations of the current entry-level models, Maruti Alto 800 included, will have a complete makeover, be in terms of design or its equipment list. The Renault KWID has set a benchmark in this segment by offering a unique design, bunched up with features like a touchscreen infotainment system and even a reverse parking camera. Coming back to the Alto 800, we are expecting Maruti to add a generous list of feature to the new version of this hatchback. In addition to the touchscreen infotainment system, expect this hatchback to come with features like reversing camera, power windows for both front and rear, climate control to name a few. Also Read: Soon a Maruti Suzuki for every Pocket for every Lifestyle! Talking about the design, as we have seen with the response that the Renault KWID has recieved, Indian are now wanting to buy cars which have stylish aesthetics. In addition to this, the persona of an SUV inspired design attracts more buyers. 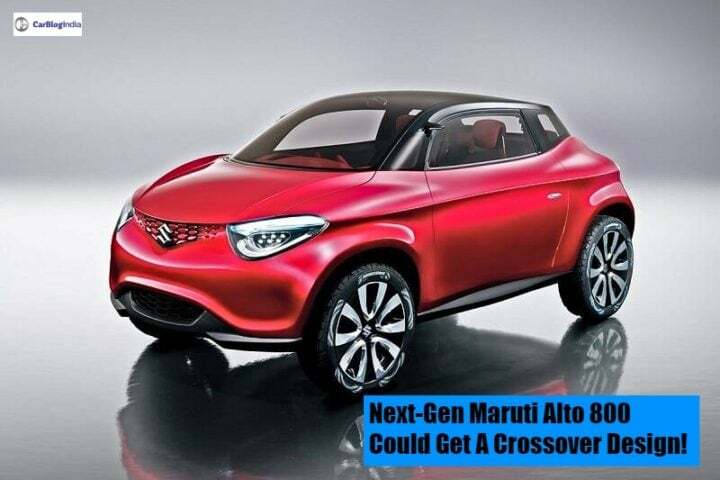 As a result, it would be safe to assume that Maruti Suzuki will employ a crossover-ish design to the new Alto 800. The production model can take its inspiration from the Future Concept S which was showcased at the Auto Expo this year. Talking about the engine specifications, the car is likely to get the same powertrain options. It will continue with the tried and tested 0.8-litre and 1.0-litre units for the K10 version. However, if Maruti decided to go a step ahead of the competition, it might introduce a BS-VI complaint engine. If that happens then it could prove the ongoing rumours of Maruti bringing the 600cc engine of the Japanese spec Alto to India with a claimed mileage figure of more than 30 km/l. For more news on the next-generation Maruti Suzuki Alto 800, stay tuned to Car Blog India.